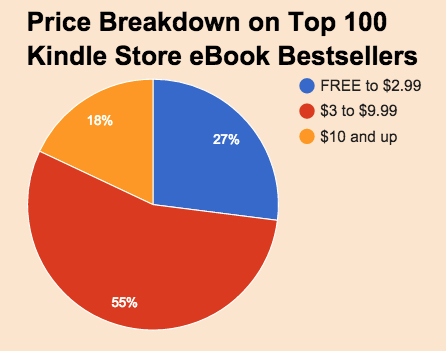 There has been a steady drumbeat of complaints lately that Kindle Store prices are going up, up and away now that several major publishers have written “agency model pricing” into their latest ebook contracts with Amazon. Is it really the case? Well, yes and no. Amazon’s calendar year list of the Top 100 bestsellers cumulatively from January 1, 2015 through October 4, 2015. There have been significant increases at both extremes of the pricing spectrum. On the low end, the number of 99-cent bestsellers increased from 15% to 24%. At the high end, the number of bestsellers priced at $13 and up has increased from 5% to 14%. The clearest indication that the big publishers are raising their prices precipitously comes when one compares that increase at $13 and up with a dramatic change over the same period in the number of bestsellers priced from $9.99 to $12.99. 22% of the Top 100 bestsellers were in that price range back in January 2013, but only 6% fell in that range this weekend. Most eye-popping is the fact that, as of October 4, 2015, none of the books in the Top 100 bestsellers were priced at $9.99, which not so long ago was Amazon’s preferred price for bestsellers and new releases on Kindle. One might conclude, therefore, that with the latest round of big publisher contracts, the publishers have soundly defeated Amazon. In our January 2013 analysis, 58% of the Top 50 bestsellers were published by the big traditional publishers, and that figure has since declined to 38%. Conversely, 42% of the Top 50 bestsellers were published by indie authors or by Amazon’s own publishing imprints in January 2013, compared with 62% this past weekend. In other words, what the big publishers have won in their latest round of contract “victories” over Amazon is the right to price themselves right off the bestseller list. And just in case you think that all of the least expensive books are self-published dreck, we’ll get into that in greater detail in the future, but the somewhat tautological truth is that these bestselling non-traditional titles are very popular, well-written books by authors with huge followings, including many who have left traditional publishers to go indie and others who have signed contracts and hit the bestseller lists with Amazon’s ever-expanding group of successful publishing imprints. We’ll look further into the consequences of these trends for readers, authors, and publishers in future posts, and also look more closely at the meaning of the discrepancy between the snapshot sales rankings and the calendar year bestsellers. But let’s stop there for now and remember that bargains, like beauty, are often in the eye of the beholder. With that in mind, we would love it if you would take 3 minutes to answer 3 questions about what constitutes a bargain in today’s ebook market, the importance of bargains, and how you find your best ebook buys. Please? It will really help us drill down on how we can best serve you at BookGorilla. And thanks in advance!